The gorgeous expanse of Waimea Canyon is a sight unlike any other, and a must-see for any who visit Kauai. 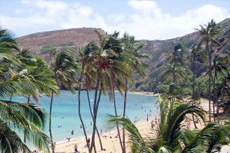 To go to a Luau in Kauai is to venture into an unforgettable world of rich culture and delicious cuisine -- a must do! A tour of the Wailua River, one of Kauai's most dramatic natural attractions, is perfect for first-timers to the island and nature lovers alike. 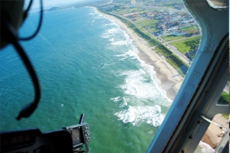 Take flight and soar over beautiful Kauai to see this amazing city in an exhilarating and exciting way on a helicopter tour. 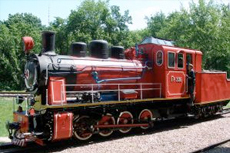 Hop aboard the Kauai Plantation Railway for a fun and enlightening tour of old Hawaii. Take a tour of famous Hollywood set locations - a great way to see the island and be a part of the pictures. Experience the rush of tubing through Kauai's open canals, tunnels and gentle rapids as you float through Hawaii's tropical blue waters. Discover beauty and tranquility in the tropical setting of Kauai. The National Tropical Botanical Gardens preserve many native species of plants in three different gardens. 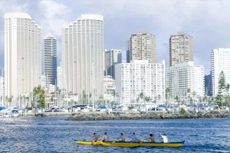 Kayaking in Kauai is a great way for the adventurous traveler to see the island. 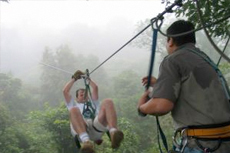 Glide over the wilds of Kauai with a guided zip-line tour, a great way to enjoy the beautiful island. 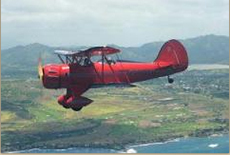 Embrace the soaring cliffs, canyons and beaches of Kauai by touring the Na Pali Coast by land, sea or air. Soar above some of the most beautiful natural landscape in the world. Catch your breath as the majestic cathedral spires of the Na Pali are suddenly beneath you and then fly alongside the ridgeline behind the lovely Hanalei Bay. 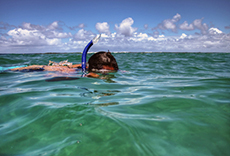 Kauai offers a wide range of snorkeling spots to explore, including a protected lagoon for beginners or children to practice. 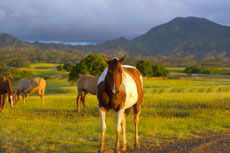 Kauai's Kilohana Plantation boasts a wide variety of activities sure to please all. 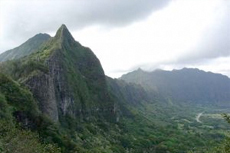 Journey through areas featured in the movie Jurassic Park and learn about the detailed history of Kauai, geologically the oldest of the Hawaiian Islands. 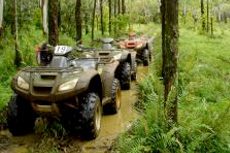 Take your trip off road with an ATV tour around Kauai. Gallop through winding trails while the nature unfolds before you. 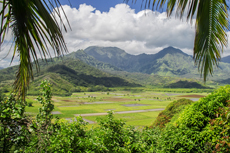 Tour Hawaii's beautiful Hanalei Valley and see nature in Kauai at it's finest! Hike through the rainforest to beautiful waterfall fed pools. 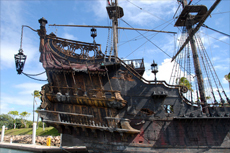 Practice your Tarzan call as you soar on a rope swing into a pirate pool, made famous in the fourth installment of the Pirates of the Caribbean. Find the golf course of your dreams on Kauai. From Princeville to Poipu, Kauai is home to some of the world's best golfing. Visitors can play beautiful resort courses or affordable independent courses, where the rough is lined with lava rocks and mountain ranges and seascapes frame the greens. 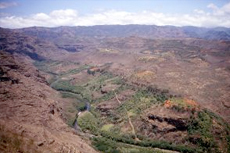 Waimea Canyon and Kokee State Park: Fourteen miles long, one mile wide and more than 3,500 feet deep, Waimea Canyon was carved over eons by rivers and floods flowing from the summit of Mount Waialeale, which, with an average of 460 inches of annual rainfall, ranks among the wettest spots on Earth. You can enjoy breathtaking views of the gorge from numerous lookouts along Waimea Canyon Drive or get a bird's-eye view of it from a helicopter. Hikers can choose from many trails, most in Kokee State Park. They range from less than a mile to a 10-mile loop and from easy to strenuous in terms of physical challenge. The park also offers a wonderful natural history museum. Wailua River State Park: If you're looking for a navigable river, Kauai is the only Hawaiian island with them. 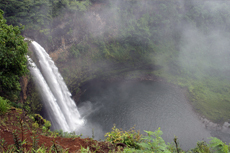 A popular stop for cruise visitors is the Wailua River, in a lush, jungle setting with waterfalls and tropical greenery. 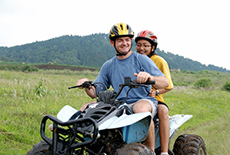 Here, you'll find activity options for all adventure levels. Active types can rent a kayak (you'll need a car to pick it up from a nearby provider) and paddle themselves; ask about the muddy hike to Secret Falls. Others can take a boat tour, usually stopping at Fern Grotto, a lava cave with ferns growing down from its ceiling. The river's Opaekaa Falls are even accessible by car; you can also stop for a picnic along the riverbanks. Kilauea Point National Wildlife Refuge and Lighthouse: More than 200 breathtaking seaside acres at the northernmost spot in the inhabited Hawaiian Islands are managed by the U.S. Fish and Wildlife Service at the Kilauea Point National Wildlife Refuge. It was established on Feb. 15, 1985, to protect and encourage the propagation of migratory seabirds and native coastal plants. 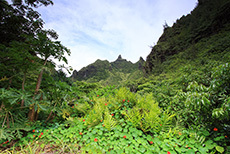 Naupaka, ilima, hala, aheahea, akoko and the rare alula plants flourish here, along with multiple seabird species and Hawaii's state bird, the endangered nene (Hawaiian goose). Spinner dolphins, Hawaiian monk seals and humpback whales also are commonly seen there. 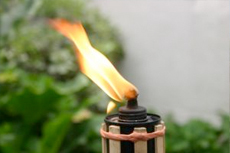 You can also visit the 1913 Kilauea Lighthouse, a perfect backdrop for your photos. Hanapepe: Kauai's "Biggest Little Town" invites visitors to take its 1.5-mile self-guided walking tour, which encompasses 69 key historic sites. 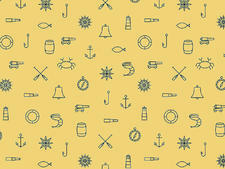 Forty-three of them meet the criteria to be listed on the State and National Registers of Historic Places, including being at least 50 years old; having a tie with significant historical events or people; and possessing high artistic values or displaying the distinctive characteristics of a type, period or method of construction. If you can, do the tour on a Friday afternoon so you can linger in town for Friday Art Night, which is held weekly from 5 p.m. to 9 p.m. About fifteen galleries participate, offering pupu (appetizers), demonstrations and special exhibits. Artists are available to discuss their work, techniques and inspirations, and most nights, a strolling musician adds to the ambience. Golf: Kauai boasts 10 golf courses at seven venues. The closest are in Lihue: Kauai Lagoons Golf Club, a Golf Magazine Gold Medal winner designed by Jack Nicklaus that boasts a cliffside location with ocean views, and Puakea Golf Course, with a mountainside backdrop. Princeville is also a prime destination for golf. The Makai Golf Club was the first course on Kauai designed by Robert Trent Jones Jr.; it was refurbished in 2010. 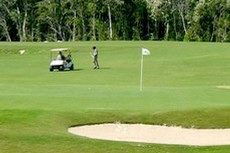 The Prince Golf Course is an island paradise, featuring jungles, ravines and a waterfall. Kauai offers a range of popular and more secluded beaches, but waters can be rough, especially on the north shore during the winter. Be sure to look into surf conditions before heading into the water. Best for a Day at the Beach: A popular and safe beach destination, Poipu Beach Park is a hit with snorkelers, families and wildlife enthusiasts. 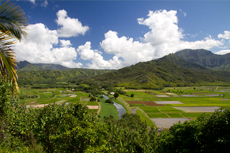 It's located on Kauai's south shore, about 25 minutes west of Lihue. Calm waters reveal colorful fish, and a wading pool entertains young kids. From the shores, you might spot humpback whales, green sea turtles or even monk seals. Located near several resorts, the beach has easy access to bathrooms, showers, picnic tables, water sports rentals, restaurants and shops. Lifeguards are on duty. Best for Families: Lydgate Beach Park is made up of two "ponds" cut off from the pounding surf by lava rock walls. Its warm, shallow waters and sandy beach with scattered shade trees are perfect for families. Beginning snorkelers and those too young to try will appreciate the clear water; you can spot fish and crabs even without a mask. Bathrooms, showers and picnic tables are available. There's also a park with an elaborate play area on the other side of the parking lot. It's about a 15-minute drive north from the cruise port. Closest to the Cruise Port: Fronting the Marriott Kauai, Kalapaki Beach might not be the best beach in Kauai, but it is the most convenient for a quick dip right by the ship. Cruise passengers cannot access the resort's pools, but they can take advantage of beachside dining and water sports rentals. It's about a 10-minute walk from the port or just a few minutes by one of the free shuttles to the adjacent Anchor Cove or Harbor Mall shopping centers.